In FY2017, the Federal programs Medicare and Medicaid combined to cover over 57 percent of the discharges from community hospitals in Kansas. In addition, the number of Medicare inpatient days is nearly 50 percent of the inpatient days in Kansas. 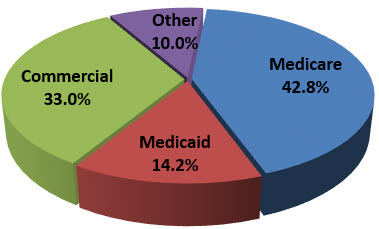 In the Federal Fiscal Year 2016 Medicare Provider Analysis and Review (MEDPAR) data file produced by the Centers for Medicare and Medicaid Services, there were 142,788 Medicare discharges from 146 Kansas facilities. The total charges for these discharges were $6,716,333,192 and total interim payments were $1,230,068,263. The interim payment to charges ratio was 18.3 percent; the average charge per discharge was $47,037.